The accuracy of our body composition analyzer is dependent in part on the client and the environment in which the test is conducted. Certain precautionary steps should be taken in order to assure accurate results. Before setting up your appointment please read through the following steps very carefully. Then schedule your testing appointment appropriate to meet these guidelines. In cases where the client has already eaten, the test should be put off until two hours have elapsed since the last meal. This is because the mass of the food is counted as weight, and thus, may result in measurement error. Although not included in the body's compositional elements, the volume of urine and excrement is included in the weight measurement. This can cause incorrect readings. 3. Do not exercise right before the test. 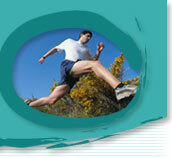 Strenuous exercise, dynamic movements or long duration running can cause temporary changes in composition. Try to test before exercise. If your exercise program includes running longer than 60 minutes please schedule your test for two days following your long run. Conducting the test immediately after lying in bed or sitting for a long period of time might result in a slight change in the test results. This is because body water tends to move to the lower extremities of the body as soon as a person stands or gets up. Sweating causes temporary changes in a person's composition. Females experience increases in body water during their menstrual cycle. While the human body is stable at normal temperatures, body composition is susceptible to change in hot or cold weather. Please allow at least an hour from being outside in cold or hot environments. 8. Wear minimal clothing Guys: shorts and light t-shirt or no shirt. Ladies: sports bra or light t-shirt and shorts. 9. If a retest is scheduled, make sure to conduct the test under the same consistent conditions as the pre-test (i.e. same clothing worn, close to the same time of day). Similar conditions need to be maintained in order to assure the accuracy of the test results. Please bring your previous test sheet with you for comparison. 10. Nutritional Concerns: The evening before your test try to consume a low sodium meal with minimal alcohol. Sodium and alcohol effect hydration levels and may alter test results. Hydrate as usual. 11. Please do not use lotion on your hands or feet on testing day. If you have any questions please phone Suzanne at 925 838-1000. Although not included in the body’s compositional elements, the volume of urine and excrement is included in the weight measurement. This can cause incorrect readings. Strenuous exercise or dynamic movements can cause temporary changes in body composition. Try to test approximately two hours after exercise or better yet, test before exercise. Sweating causes temporary changes in a person’s composition. While the human body is stable at normal temperatures, body composition is susceptible to change in hot or cold weather. 8. Wear minimal clothing (guys: light t-shirt or no shirt and shorts, ladies: sports bra or light t-shirt and shorts). 9. If a retest is scheduled, make sure to conduct the test under the same consistent conditions as the pre-test (i.e. same clothing worn). Identical conditions need to be maintained in order to assure the accuracy of the test results.